Preheat oven to 375°. Grease 18 muffin cups or line with paper cupcake liners; set aside. Bake 20 minutes or until toothpick inserted in centers comes out clean. Cool on wire rack 10 minutes. Remove from pans and cool completely. Dust, if desired, with confectioners sugar. 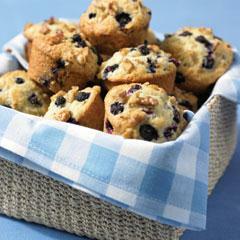 *For even baking, fill any unused muffin cups halfway with water. Tip: Add 1 cup of chopped nuts. Also terrific with Shedd's Spread Country Crock Spread. By using Shedd’s Spread Country Crock® instead of butter in this recipe, you reduce the amount of saturated fat by 4.5g and save 30 calories per serving.